Dungeon Stars is a unique little game that attempts to blur the line between free-to-play casual and full console title. This isn't necessarily a bad thing: I could see a mixture where a full console title gets a million pieces of DLC to speed up play or gain an edge over competitors....wait....we see that every day. No, Dungeon Stars takes some of those addictive beats of F2P and actually makes them fun to attain in a console setting. Within Dungeon Stars, you're playing an endless runner of sorts. There's a dungeon, there's bugs and goblins within, and the heroes must traverse the depths to clear them out. Primary goals include unlocking tons of new characters, weapon upgrades, and pets to accessorize with for additional attacks. You have defense, strong and weak attacks, and special powers with cooldowns. As I said, it feels like a free-to-play. The game is twisted to accommodate a more traditional style of play by subverting the usual consistent press to unlock more and just making the game fun, with a strategic element you usually don't see in such a game. There's a double rock-paper-scissor attitude to the game. Characters have powers that are color coded depending on the power and boil down to red, green, and blue. Red beats green, green beats blue, and blue beats red. Enemies are color coded as well and can be bested by the right enemy. You select a combination of heroes and can swap between them at any time (with a bit of a cooldown). You have to take the right hero against the right swarm of enemies. The second "rock paper scissors" part is in the actual attack. Your character will auto-attack but you can spam the button to crank up your attack speed. Certain enemies will have a shield which can only be taken down with an extra powerful attack. This big slam opens you up to attack but is the only way to open these big bads up to regular damage. Enemies will throw large attacks at you as well and you can minimize the damage by blocking. You take less damage, but you also open yourself up to additional damage from the little stabs being thrown your way by all the other enemies. The two "rock paper scissors" combine with the special moves available to each character. An ice character might throw an arcing freeze that will chill out enemies down the line, preventing them from rushing up and controlling the crowd, while a poison character will throw a slash that will hit every character on the screen and start poisoning them making them have less health when you finally get within striking range. As you press on you eventually meet boss characters that require a bit more strategy on which weapon, character, and power to use to get through without taking damage. 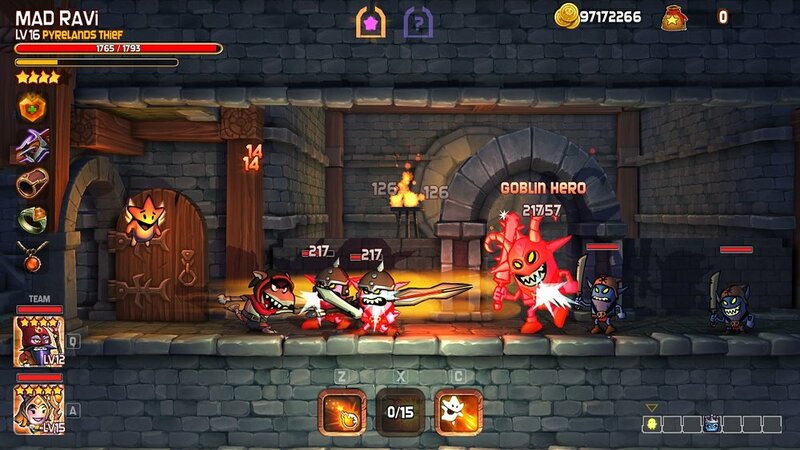 Dungeon Stars diverges from F2P with it's progression system. As you press forward, your character levels up. You can use items to speed the process up, but you either find them or purchase them with treasure found in the dungeon. Each challenge consists of a few floors. Between floors you can edit your team and heal (if you have the items required). If everyone on your team is defeated, it's back to the start. You keep any rewards found so far which will help you make characters stronger and eventually pound your way through the challenge. This is the one point I wish they had changed from F2P: you're stuck at one point until you push past it. I'd have loved to be able to go back to earlier levels if I'm particularly stuck and fight my way back for variety's sake, but it appears you simply have to keep beating against that wall until it comes down. The game is very cute, with a 3D world and 2 dimensional characters. They feel like cut-outs making their way through the world, but they all cast shadows realistically. The special attacks are simple but effective. By and large there's only so much a game like this can do: you're moving left to right and whacking bad guys until you get to the end. This is another part of the free-to-play feel of the game. All of the characters do feel fun and unique, though. They are all well animated and don't just feel like cobbled together parts to claim variety. 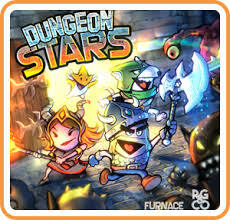 Dungeon Stars has a lot of fun within it's doubled rock-paper-scissor style of gameplay and encouraging level-up system. It's able to scratch the free-to-play itch without slamming advertisements down your throat and trying to get you to spend more past that initial $9.99. It's lengthy, but not necessarily deep. As you keep unlocking more and more characters, weapons, pets, and levels, you get that free-to-play high without the free-to-play fee. 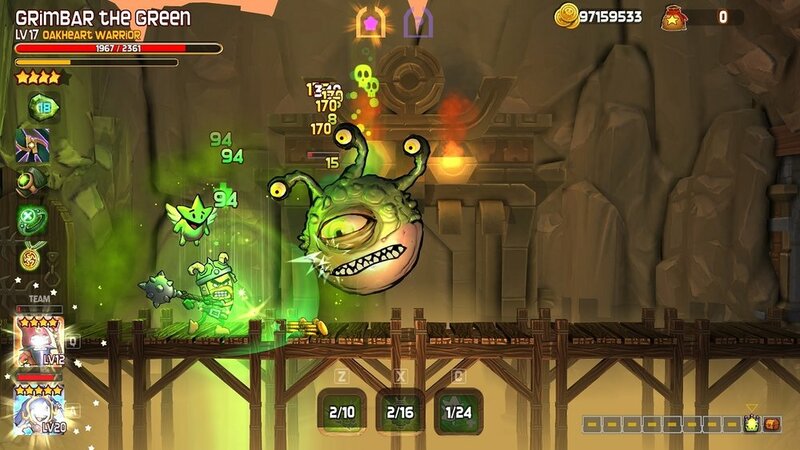 Dungeon Stars is a great diversion for some of those short-burst gaming sessions you would usually grab your phone for without having to sit through the commercials. Grab it for a fun strategic twist on a familiar game style. 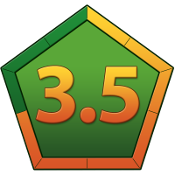 Special thanks to Dungeon Stars/Furnace Games for providing a download code for review!